We've been reading this book every night for the past week, so it was inevitable that Rebecca declared today "Fancy Rebecca Day" the moment she got out of bed. She donned pink and purple tights with sparkly hearts, a purple ankle-length skirt, pink sequined shirt, purple lace cardigan and some Mardi Gras beads, and headed downstairs for her delectable breakfast at Chez Michelle. This takes me such a small amount of extra effort, and makes her indescribably happy. There was not a crumb left of her peanut butter and jam pancake stack, two cups of milk were consumed, and I earned some brownie points. Today also marks one year since I wrote my first blog entry, when I barely knew how to turn on the digital camera, and had no idea what HTML codes were (well, I suppose some things never change). I still get a thrill whenever I see a comment on one of my posts, and when I realize that those blog stats aren't rising just because I'm clicking on my own page. Thank you so much for coming here, checking in on me every once in a while, and sometimes leaving a comment or two. I've made so many friends, learned so much, accomplished more than I imagined. So, a new year, a new look. I think it's like a new haircut, I have to wear it for a while, get used to seeing it in the mirror, and then I'll decide whether I like it or not. What do you think? Happy Blog Birthday! Special for the babe, special for the momma. Life is good! Happy blogaversary and when can I come for breakfast at your house? 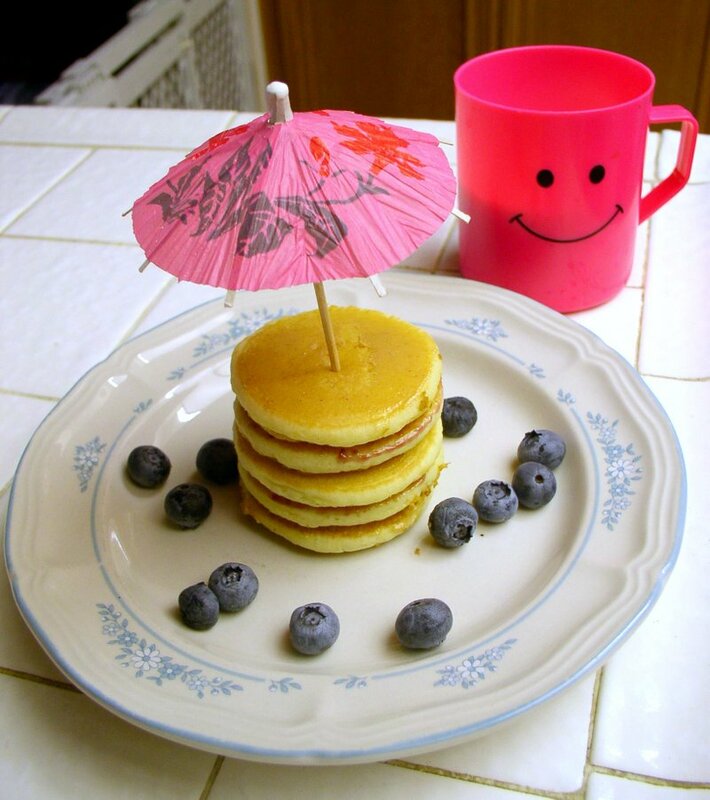 Such a cheerful looking breakfast! Aww...love the little umbrella. Nice touch! oh yes...and like the new look. That is indeed a breakfast for a princess! Congratulations on your one year blogiversary, Michelle! Congrats on your blogaversary! And thanks for the lovely package! I'll be posting soon. It's hard to take good pictures with all the gray outside. Happy blog anniversary! I'm your new Special Swap partner and I'm looking forward to getting to know you and reading your blog. happy 1 year blog day!! and many more to come.!! and i thought i was the only one who put Jam on pancakes!! !